As with many movies that I like, I went to check out the soundtrack for Yes Man. 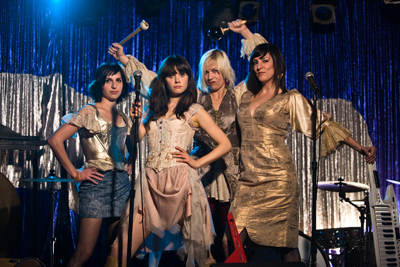 I was especially interested because Zoey Deschanel's fake band in the movie - Manchausen By Proxy, made up of Zoey and the San Franciscan band, Von Iva, has songs on the soundtrack. I was going to get the Manchausen By Proxy songs on iTunes, but it was one of those annoying albums where you have to buy the entire album. Since I didn't want nine Eel songs, I went to Amazon and bought just the ones I wanted, "Uh-Huh" and "Sweet Ballad". I thought the lyrics were pretty funny and I went to look them up. At first I thought someone did a really bad job capturing the lyrics because where it clearly said "Amoeba Records" and "Trader Joes" the lyrics said "My Records" and "Trader Place". Then Aaron pointed out they probably did have the rights to use those trademarked names... ohhhhh. That was a pretty good movie and the 'name' of the band cracked me up! She & Him is also awesome!